“We gravitated toward each other,” Whitney says of meeting Dan in 2009. She had recently graduated from Algonquin College and moved to Belleville for a job and to be near her family. Whitney had come to visit a friend in Ottawa for the weekend. Dan was the twin brother of her friend’s then-boyfriend. They talked until the early morning hours. After that weekend, the two continued to get to know each other, talking on the phone and meeting up every weekend. Their relationship blossomed and over the next five years Whitney gave birth to two sons. In August 2014, Whitney, Dan and their boys went up to Dan’s family cottage in Bancroft for a week, staying in a cabin on the property. “It was the worst week ever,” remembers Whitney. “It rained, there was nothing much to do.” One night they were almost accosted by a flying squirrel. Whitney was not pleased when Dan announced that he had to return to Ottawa to play a hockey game. Unbeknownst to her, what he was really doing was picking up the wedding ring and drove back with the ring hidden in the car’s spare tire. Upon his return, Dan gathered their sons, got down on one knee and asked Whitney to marry him. 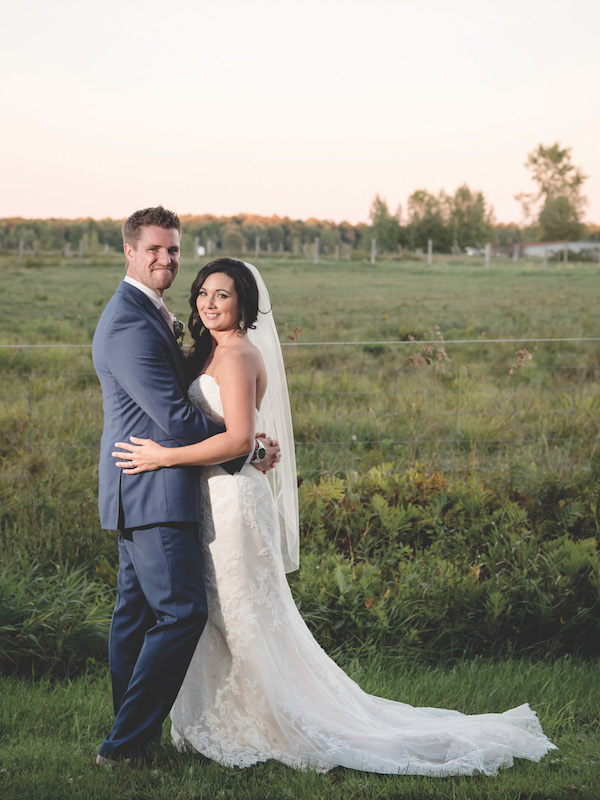 For her wedding dress, Whitney chose a Maggie Sottero gown from With Love Bridal. An ivory over pale blush, “it’s very subtle, very romantic,” said Whitney. The fit and flare dress featured corded lace over a chic organza with a corset back. A beaded a.b. Ellie sash topped off the wedding look. The ceremony focused on their journey as a couple. “It was an amazing experience,” said Whitney. 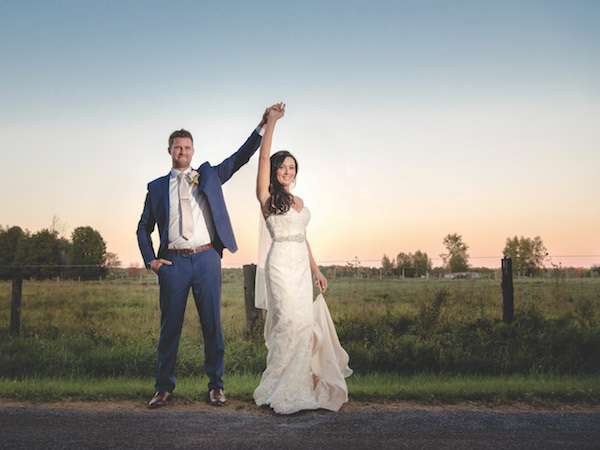 “Every single detail from leading up to us meeting, to our life together, our children — that was very special.” The officiant told the assembled guests that they had shared in the experience of shaping Whitney and Dan as a couple. During the ceremony, they created a “marriage memory box” containing a bottle of wine and sealed love letters to read to each other on their fifth anniversary or if they come upon hard times. After the ceremony, Whitney and Dan were whisked away by horse and carriage to enjoy some champagne and alone time. “We were able to reflect on the moment that had just happened,” she said. The guests enjoyed a wonderful meal catered by Bean Town Ranch. Whitney’s mother baked a small wedding cake — chocolate cake with vanilla icing and the florists [created] an arrangement to go on top, as well as cupcakes to match the wedding colours — blush, white and chocolate. To top it off, there was late-night poutine. They ended the wedding with a dance on a private island surrounded by paper lantern lights and fireworks in the sky. “With the beautiful lights in the sky and everyone surrounding us, it couldn’t have been more perfect,” said Whitney.